Single-use plastic takeaway containers, takeaway cutlery and single-use plastic bags will be among the items eliminated from campuses by September. Takeaway coffee cups and straws will also be removed from campus by the start of the next academic year. Plastic water and soft drink bottles will be phased out by 2020. 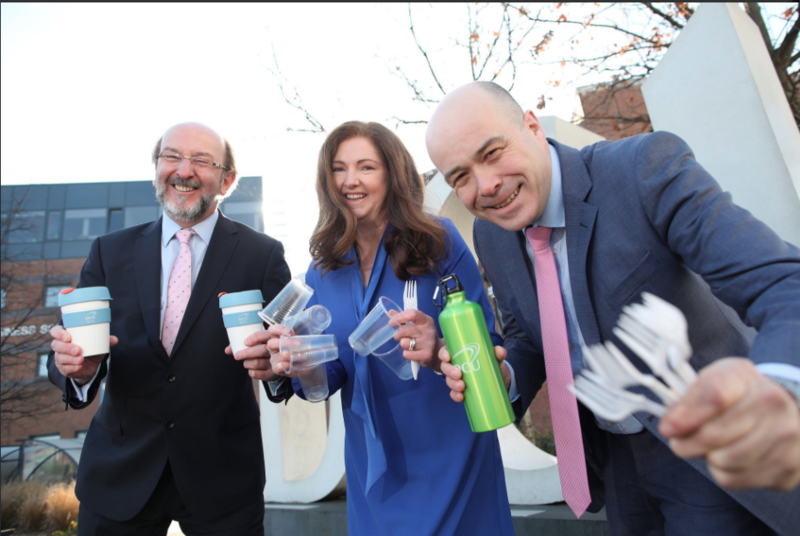 Minister for Communications, Climate Action & the Environment, Mr Denis Naughten TD commended DCU staff and students for their proactive stance on the issue. “As a society we discard an incredible 80 per cent of what we produce after a single use. We have a global and a national plastics crisis and our young people are central to solving it through leading by example and helping to change collective behaviour,” he said. President of DCU, Prof Brian MacCraith, explained why the staff and students of the university decided to implement this policy. “Our prioritisation of sustainability as a key theme reflects DCU’s commitment to address a very real challenge, both at local and global levels. Today’s announcement is the start of a journey which will help set best practice for our students, staff and society around us,” he said. DCU’s green week took place during week 8. It is an initiative which was led by the Students’ Union and DCU’s Sustainable Living Society. It featured talks and discussion on the sustainability initiatives by DCU and the replanting by students of a wild flower meadow beside the university library with seed bombs.